It’s here! 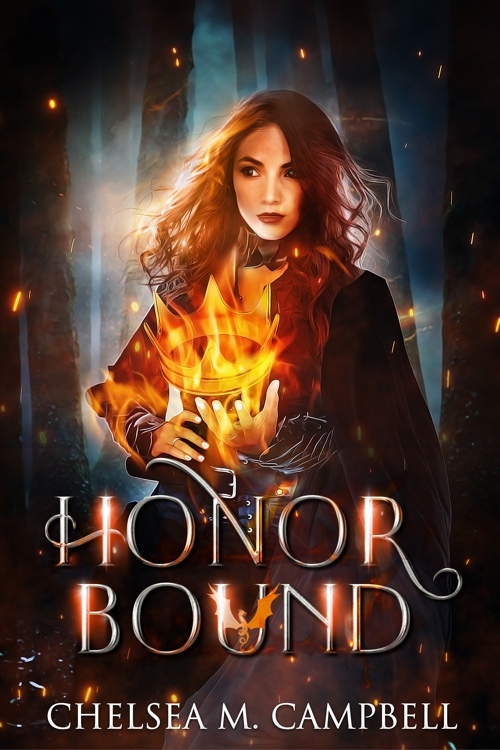 I am so excited to show you the super gorgeous, amazingly shiny cover for Honorbound! I’ve seen it a bunch of times now, and every time I’m still like, “Whoa.” This cover was created by the uber talented Fiona Jayde of fionajaydemedia.com. If you’re an author looking for an artist, I wholeheartedly recommend her! She was great to work with, her prices are more than reasonable, and her artwork is crazy awesome! When Amelrik proposes, Virginia couldn’t be happier, even though she knows the king of Hawthorne clan will never allow his only son to marry a St. George. But the situation turns out to be even worse when Cedric, the appointed heir, refuses to come home and marry for a political alliance. If Cedric doesn’t show, the king’s going to make Amelrik take his place, meaning Virginia will lose him forever. Determined not to have their lives decided for them, Virginia and Amelrik set out to find Cedric and convince him to come home. But when a group of paladins takes over the city Cedric’s been living in, on the grounds that there have been recent dragon attacks, they put the town on lockdown. No one’s getting in or out, dragon or human. Sooner or later, any dragons stuck inside the town will have to transform and reveal themselves, and Virginia, Amelrik, and Cedric find themselves trapped. Things only get worse when Virginia’s dragon-hunter sister, Celeste, shows up to aid the paladins. And as the dragon attacks increase, so does the town’s paranoia. Time is running out, and soon Virginia and Amelrik are fighting just for survival. If they can’t figure out what’s really going on, and soon, it won’t just be their love that’s in danger—it’ll be their lives. COVER COMING SOON!!! Add it on Goodreads! Since I’ve had several people ask recently, here’s a quick update on if/when The Betrayal of Renegade X will be an audiobook. The answer to “if” is YES. The answer to “when” is VERY SOON. I can’t give any specific dates yet, but production should start in a few weeks or so. At the moment, I anticipate a June release, but, again, I can’t be sure on the specifics yet, so keep in mind that that’s a tentative date. I will post updates once I know more. All the Renegade X books are on sale today–books 1-3 are $1.99 each and book 4 is $2.99, and both the novellas are FREE! A few other books in my backlist are on sale as well. Check out all my books here. Get the free novellas: The Haunting of Renegade X and The Torment of Renegade X. Okay, so, apparently the newsletter signup on the website was kind of a piece of crap and wasn’t working right. Or at least the WordPress plugin wasn’t working. I switched it out for an embedded form instead, and it seems to be okay now. When you sign up, you’ll get an email asking you to confirm your subscription, and then after you confirm, you’ll get another email with the link to Damien Locke’s Guide to Golden City, which is a downloadable 18-page PDF full of funny anecdotes and snarky conversations between Damien and Riley. If you signed up for the newsletter and didn’t get your copy of the guide, I just sent out a newsletter with a link, so you should have it now. If you sign up for the newsletter after reading this and it still craps out and doesn’t send you anything or do what it’s supposed to, please email me at campchelsea@gmail.com so I can fix it and send you your copy. But, like, hopefully it’s working now and won’t screw up. The Kickstarter for book 4 is now FUNDED! That means that I will for sure be able to publish The Phobia of Renegade X, and it will have cover art by Raul Allen, who did the gorgeous wrap covers for books 1-3. A HUGE THANKS goes out to everyone who’s pledged already, and to anyone who’s helped spread the word about the campaign. I couldn’t do this without you guys, and I’m so excited that this book is going to be a reality and that I’m going to get to share it with all of you! And there are still FOUR DAYS left to go, so if you haven’t pledged, there’s still time to get your early bird copy of Phobia, or a signed book, or the superhero definition mug! (Actually, those should both be “and/or” instead of just “or,” because the signed books and the mug all come with the early bird copy, but I thought “and/or” didn’t look as cool. But still, you know what I mean.) Backers also get their superhero or supervillain name listed in the back of the book, so if you’ve always wondered what the Citizens of Golden City section was about or wanted to be part of it, now’s your chance. Kickstarter Update – Almost There! The Kickstarter for The Phobia of Renegade X is 91% funded, and with only 8 days left to go, we’re in the home stretch! Help make the next installment in the Renegade X saga a reality and get to read it before anyone else! Thanks to an AMAZING first couple days, the Kickstarter for The Phobia of Renegade X is already at 60%! And there are still 25 days to go! If the campaign gets funded with time leftover, I’ll do stretch goals aimed at getting the next audiobook done again (crossing my fingers for it) like I did last time. I added a MUG AND EBOOKS tier for people who just want to get the superhero definition mug and the ebooks. There are 2 NAME A CHARACTER incentives left and 1 ULTIMATE NAME A CHARACTER (where you get to name a character, and you get hardback copies of all four books, and a paperback copy of the novella, and the superhero definition mug). If you’ve ever wanted to be able to open a Renegade X book, point to a character’s name, and say, “That’s me!” then this is your chance. A huge thanks to everyone who’s pledged so far! I wouldn’t be able to do this without you guys. Damien’s always been afraid of heights, but he’s never been afraid of fieldwork or of being in the spotlight. At least, he wasn’t before the gala—the one where his grandpa nearly caused a massacre and heroes from the League almost killed his best friend. Now he finds himself dreading the very things he used to love, and all he wants is to skate by in school, avoid fieldwork, and keep a low profile. I’m almost done with The Haunting of Renegade X, the novella that takes place between books 2 and 3. I’ve only got a couple more scenes to write, and with my recent health improvements, I can actually write steadily every day. Which means this story will actually be out in a few days. It should also mean fewer delays between books. Oh, and that I can function and feel like a real person. Whatever. Damien doesn’t believe in ghosts, even when he hears the voice of his ex-best friend Pete calling to him from the Banking and Finances building, the scene of his death. His new friend Riley doesn’t believe in ghosts, either, but when Damien confides in him about what he thinks he heard, the two of them decide to investigate. On Halloween night. A decision they come to regret as soon as Pete’s ghost traps them inside the building. It turns out Pete’s got unfinished business with Damien concerning the collapse of their friendship. Damien’s always blamed Pete for how it ended, but now Pete forces him to acknowledge the part he played in it. In order to survive the night, Damien will not only have to figure out how to fight a ghost, but he’ll have to tell the truth about his past–even when that truth threatens to destroy his new friendship with Riley. This story started out as part of the kickstarter for book 3. For one of the stretch goals, I said I’d write a short story holiday special. Backers got to vote on which holiday the story would be about, and the votes were overwhelmingly for Halloween. When I started thinking about what this story would even be, I had no idea what I was going to do with it. I was picturing something short and light. Maybe 5k – 10k. So of course it turned into a super intense 20k novella. I’m planning to release it both in ebook formats and in paperback, and hopefully there’ll be an audio version at some point. Sign up for my newsletter (on the left, beneath the orange button) to be notified as soon as it comes out.